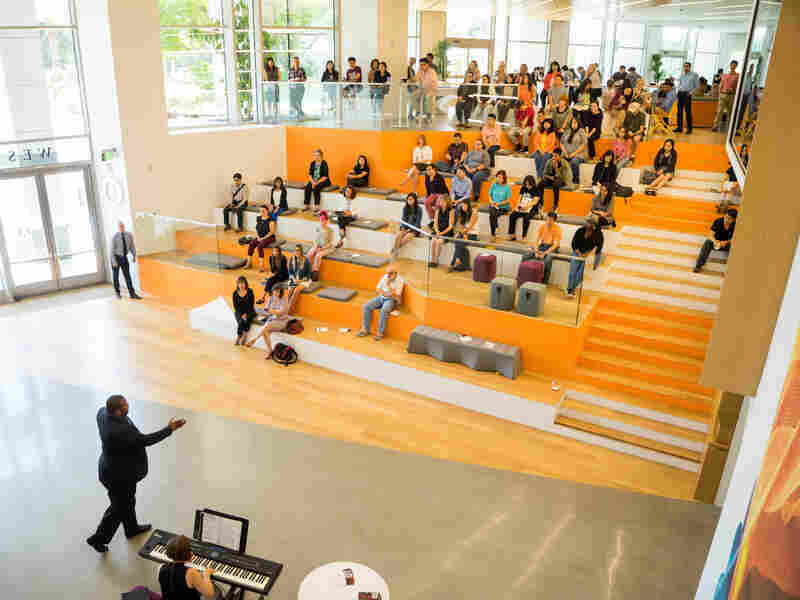 New Pop-Up Series Treats Silicon Valley Workers To Opera At The Office : Deceptive Cadence Rachael Myrow of KQED reports on Arias in the Office, Opera San José's initiative that aims to bring opera to a wider audience with free performances at tech companies. Soprano Katharine Gunnink sings the aria "Ch'il Bel Sogno" by Puccini at Adobe Headquarters in San Jose, Calif. for Arias in the Office. The lobby of a Silicon Valley tech company is not where you would expect to hear a soprano belting out a Puccini aria, but that was exactly what happened at the first performance of Arias in the Office. 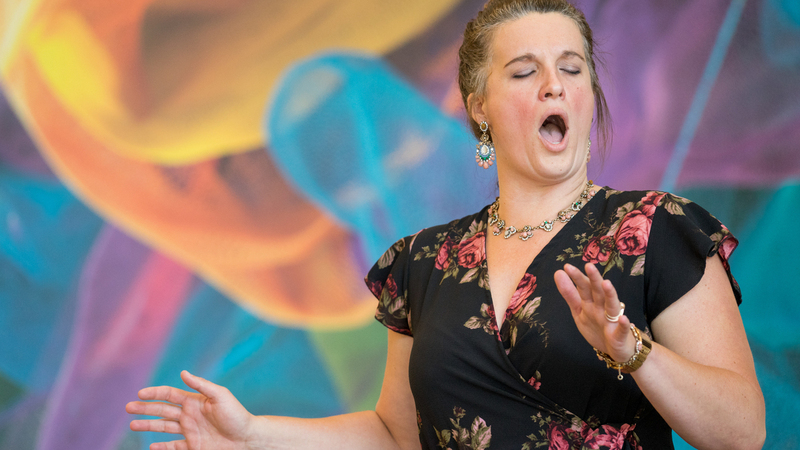 With "Ch'il Bel Sogno," soprano Katharine Gunnink kicked off the new pop-up series at Adobe's San Jose headquarters at the beginning of August. The initiative by Opera San José aims to introduce people to the very concept of opera as something that can be fun and enjoyable. "That's the idea — to bring what we do, and the level at which we do it, to people who've heard it and are fans, or people who've never heard it," explains Aaron Nicholson, director of Marketing and Development for Opera San José. The free performance had the intended effect on Jyh-Jiun Liou, a software quality engineer for Adobe who has lived in nearby Sunnyvale for 25 years but had no clue Opera San José even existed. Trevor Neal performs for Adobe employees at the company's headquarters in San Jose, Calif. as part of Arias in the Office. "Not a fan, but I really like it," she remarked. "So if I see they will have a performance — maybe I will purchase a ticket." On the other end of the spectrum was Zori Sanchez, of Adobe's finance department. Sanchez is a single ticket holder who says she "periodically" goes to the opera with friends. "I tend to go with people who kind of love it," she says. 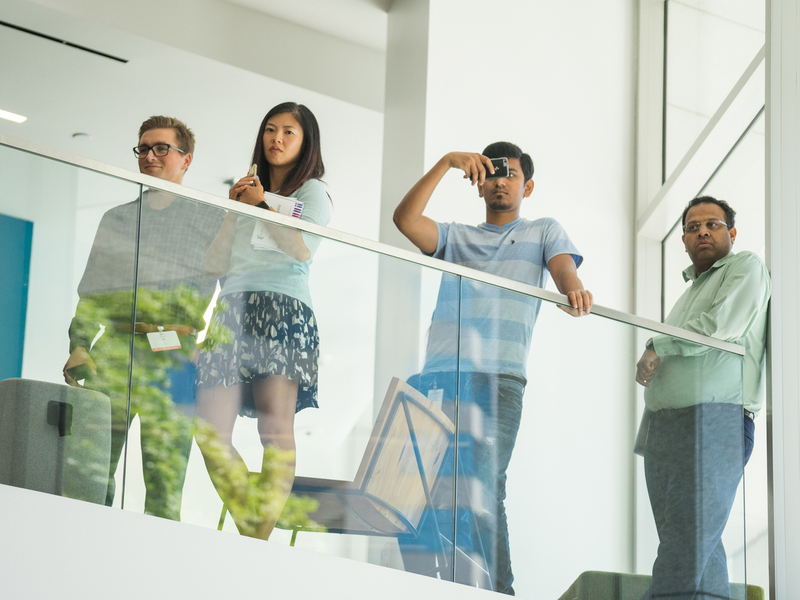 About 60 self-selecting attendees gathered in the Adobe lobby for the free performance — and more curious passers-by looked on. Such pop-up concerts in non-traditional venues, like parks and pubs, have helped a growing number of opera artists cultivate new fans. Adobe employees listen to Katharine Gunnick perform during the first performance of Arias at the Office. Opera on Tap is a national non-profit focused on taking the art form beyond the opera house in the name of community outreach. "We can't just expect that if we put together a great season, people will come," says Indre Viskontas, a soprano with the San Francisco chapter. "We need to go to where they are and show them how awesome our art is. And then they'll come to some of the bigger productions." For workers at some Silicon Valley companies, Arias in the Office might very well be pleasantly surprising lunchtime entertainment. But for opera singers and performers, the pop-up series is not just a means of expanding their audience, but also continuing the relevance and vibrancy of their art form.